I’ve known Cullen for years. He is one of the head bartenders at Elysium in down town Austin. 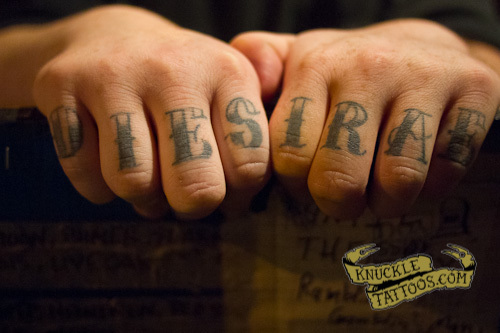 I spotted his knuckle tattoos recently and asked about them. He said that they were his first tattoos and he got them when he was drunk. When I asked what they meant to him I got a lecture on the history of the Dies Irae, which as it turns out is one of the four hymns kept by the Catholic church during the reformation. It is immensely influential in all of classical music and beyond. It is quoted in pieces by Mozart, Stravinsky and many others. I am now in love with your friend!